There’s a lot to love about bee pollen. Not only does this amazing product offer almost all the nutrients the human body requires, it is also packed with amino acid-dense protein – it offers more protein than any animal source – making it one of the best foods available from nature, an almost perfect supplement to add to any health-focused arsenal. In addition to easily absorbed protein, bee pollen offers both water- and fat-soluble vitamins, minerals, fatty acids, enzymes and antioxidants, which together provide so many health benefits that in Germany, bee pollen has been officially recognized as medicine by the German Federal Board of Health. Reduced inflammation. Bee pollen, the result of much hard work on the part of honey bees, has anti-inflammatory properties that have been compared to drugs including naproxen, according to several 2010 studies. Protection against oxidative stress. The antioxidants can help stop free radical activity, making the supplement a perfect option for healthier skin. A boost to the immune system. According to a 2014 study appearing in the journal Food and Chemistry Toxicology, bee pollen has antimicrobial properties that can kill off bacteria including candida and staphylococcus. Fewer side effects from allergens. According to a 2008 study from Japan, bee pollen may inhibit the activation of mast cells, which play a role in allergic reactions. Faster recovery after exercise. Because it has protein that can be quickly used, taking bee pollen shortly after a workout can help provide essential fuel for not only strengthening muscles, but also rebuilding damaged tissue, leading to a speedier recovery. 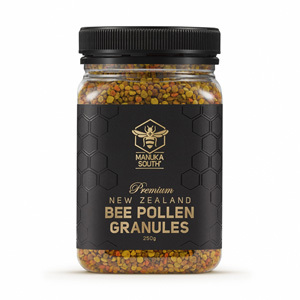 Bee pollen, can be used in a variety of ways in granular form, either added to yogurt, tossed into smoothies or sprinkled over cereal. Capsules also offer the same great health benefits.